For The First Time, A Team Of Refugees Will Compete At The Olympics : Parallels Ten refugees — swimmers, runners and judo athletes — have been named to the first-ever Olympics refugee team. They'll compete this August in Rio, where two of the refugee athletes already live. Popole Misenga (right) trains at Rio's Instituto Reacao on April 14. In an Olympic first, 10 members of an unusual team will be competing at the Summer Games in Rio de Janeiro: a squad made up entirely of refugees. Those who made the cut include Popole Misenga and Yolande Mabika, two refugees from the Democratic Republic of Congo. They are already living in Brazil, where the games open on Aug. 5. Agile, fast and relentless, they are training for Olympic glory in judo. Like many refugees, they faced war and hunger in Congo, where millions have perished in violence over the past two decades. But they ended up here in Rio in an unexpected way. Mabika, 28, recounts in Portuguese how both she and Misenga, 23, were part of the Congo's national judo team when they arrived in Brazil three years ago to compete in the Judo World Championships. During the competition, their coach took the whole team's documents and all their money and disappeared, she says. "We were hungry," she recalls, "and no one was helping us. I would approach black people like me on the street, speaking French, asking if they were African. I couldn't understand or speak Portuguese then." Finally, she says, she was directed to a hair salon where many Africans worked. "I cried so much, my eyes were red," she says. Both she and Misenga slept there for weeks. Mabika says they both became official refugees, but had little support. Her first job in Brazil was cleaning heavy industrial equipment. But she begged people to help her get back to the sport she loved and excelled at. 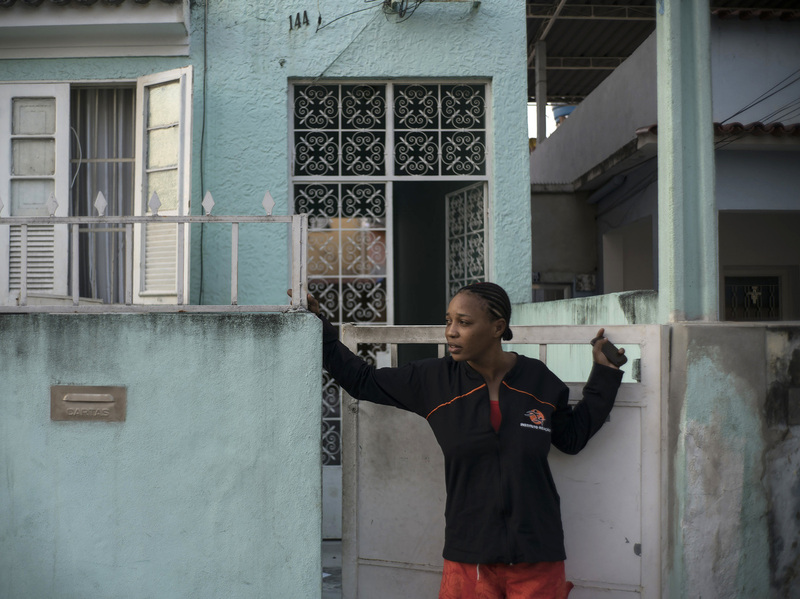 Yolande Mabika, a refugee and judo athlete from the Democratic Republic of Congo, stands outside her newly rented apartment in Rio de Janeiro. 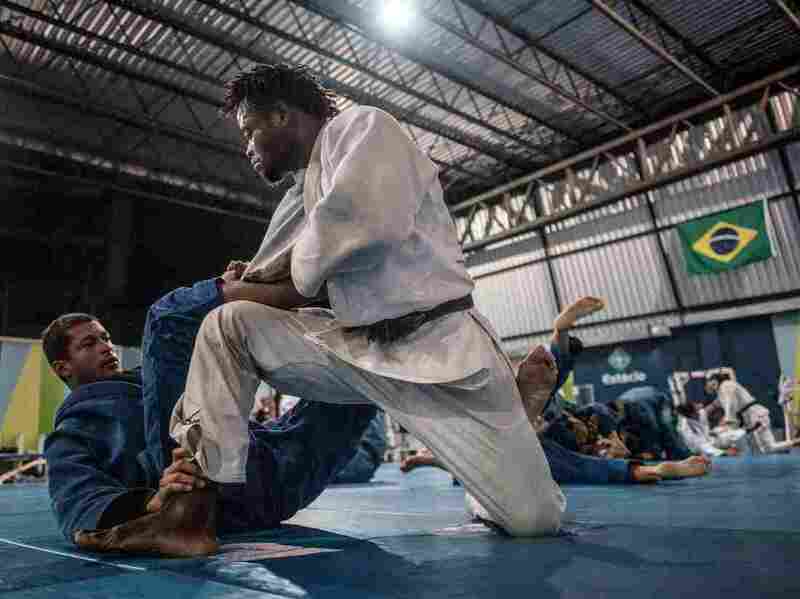 Mabika and fellow Congolese athlete Popole Misenga came to Brazil in 2013 to compete in a judo championship; they became refugees after their coach vanished with their passports and money. Local news picked up her story and put her in touch with a judo coach, who has been training her and Misenga. Misenga says they are now refugees twice over. Both lost contact with their families years ago. "There were kids who were 5 and 6 who were actually fighting," he says. "I was trying to run away from that. I lost my mom in the conflict. I just wanted to escape. A lot of friends were killed in the street where I was living." Mabika says she learned judo at a UNICEF refugee center that she grew up in from the age of 10, after she was separated from her family. She joined Congo's national team in her teens. She says conditions were awful. "If you didn't medal," she says, "they would starve us. It was a tough life, very tough." That is why they both decided to stay in Brazil and seek asylum after their coach vanished during the 2013 World Championships. Misenga has married a Brazilian woman and they have a child. Mabika was able to rent a small apartment just two weeks ago in a favela, or shantytown. Eight other athletes have been selected to take part on the Olympics refugee team, which will walk in the opening ceremony under the Olympic flag. The other athletes include two swimmers from Syria, a marathoner from Ethiopia and five runners from South Sudan. The International Olympic Committee, which announced the team Friday in Geneva, calls their inclusion in the games a "signal to the international community that refugees are our fellow human beings" and a symbol of hope for all refugees. "It's the dream of every sports person to be in the Olympics," Mabika says. "It's a chance you will never forget. If I ever have my own family, I will tell my children everything I have been through in my life to get here."